Ask fellow campers about "Wompatuck State Park" and nearby attractions. 260 site campground with about half with 20 amp electric service. Water spigots throughout. Sites are wooded with mostly hardwood mature trees. There is at least 100 feet between sites. Large sites, couldn't hear neighbors conversations. Loop M backs up to woods so no one behind us. The bathroom was decent for a State Park with 3 shower stalls. The roads are one way smooth and well paved. 12 miles of trails for biking or walking. Fishing and canoeing available. Geocaching in the park. 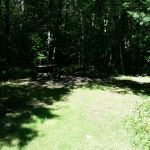 Each site has fire ring and picnic table. Buy your wood when you check it, the campsites are about a mile in. The dump station is conveniently located as you leave. The park is over 3500 acres. The spring house for Mt. Blue spring is down the road to the left going in, to the right leaving. Lots of people come here with gallon bottles getting fresh spring water. We camped at Wompatuck State Park in a Motorhome. Not much organized activity place, no store in campground. Pick up your wood when you sign in, as campground is about a mile in. This is exactly what I look for in a state park campground; roomy sites with good separation, clean, quiet, and peaceful. We camped at Wompatuck State Park in a Motorhome. Check out the history of the park. This was a munitions depot during World War II and there are remnants visible throughout the park including the campground. 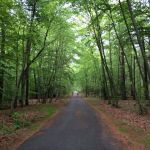 Miles of paved and unpaved trails for cycling, running, and walking. No facilities (laundry etc). We camped at Wompatuck State Park in a Motorhome. The best thing about this park is you can access Boston from it, it's about 4 to 5 miles from the ferry $4.50 each way. You can get über to the ferry or drive. We biked. The park is beautiful but staff found every reason in the book for not keeping facilities clean. Mold in the showers, dirty floor, etc. We camped at Wompatuck State Park in a Motorhome. Beautiful forest park with well-spaced sites and clean restrooms just outside a beautiful old small New England city. Convenient to ferry to Boston and roads to Plymouth and Cape Cod. We'll be back on our next New England trip. We camped at Wompatuck State Park in a Fifth Wheel. Good lobster prices at the Lobster Trap attached to the muffler shop in Hingham. Rate reflects non-MA resident, electric only site. Since there was no water or sewer at any of the sites, we used their showers; they were fairly clean, hot water, and some even drained. Spotless and new? No, but adequate. We eventually got our 38' with opposing slide-outs in there and level. Some tree branches were touching the back and top. We were too close to the fire pit to have a fire. If you are big, be picky on which site you choose. Neighbors were far apart. Lots of folks gathering damp wood from the park for their campfires which resulted in lots of smoke in the air at night and sometimes during the day. GPS took us to a non-entrance to the park. Make sure you approach from the north west of the park on Union street; use the address on the web site (doh!). Hiking and biking trails were plentiful and well marked. Note, there is no swimming; the major body of water is a reservoir. We camped at Wompatuck State Park in a Fifth Wheel. Pro: Large, treed sites, electric (20 amp only), trails. Biking, hiking, natural spring. Quiet. Con: occasional plane noise, no play ground, no camp store. Highly recommended. We camped at Wompatuck State Park in a Motorhome. The park is beautiful and peaceful with grassy as well as wooded areas. The sites are spaced well apart and are somewhat secluded. There are miles of walking, hiking, and biking trails. The staff was friendly and welcoming. We would stay here again We camped at Wompatuck State Park in a Travel Trailer. This is a top notch campground. I can't say enough good about them. Even the restrooms are extra nice. The sites are all really level. There's only electric but there's water on every road, so easy to fill up. It's really clean water. I can't wait to camp here again. We camped at Wompatuck State Park in a Motorhome. They aren't suppose to have water hook-ups but they didn't say anything to someone in a motor home that hooked their water hose up to the community water. The motor home must have had a hose that was at least 75 feet long, but they got away with it. No one ever seemed to be at the gate so you could just drive into the campground and camp anywhere that was open. The quite hours were not enforced. Our bathhouse was broken so we had to drive to another one, and some campsites had 3-4 cars at them to where they were half way on the road and it was hard to get by them. The sites were big and nice. They all had fire-pits and plenty of room and privacy. I'm not sure if we would go back just because that park seems to draw the type of people that don't respect rules or campground property. We camped at Wompatuck State Park in a Tent Trailer. This place COULD be so nice: but it is not! The bathrooms have a card that is signed each day by someone that allegedly cleans them, this is a hoax. One shower did not even have a curtain, and one toilet had the same grunge (bad stuff) in the bowl all three days we were here. If you consider taking a shower, wear shoes, the floor is disgusting! The check in was nice, and the site was great and very private. This is also one of the first places I have been that does NOT have a water hose at the dump station. It is a shame to see such a beautiful park with so much potential in this condition. Not sure who dropped the ball. We camped at Wompatuck State Park in a Truck Camper. We stayed in the loop with electric on the sites. Restrooms were in need of being remodeled as they are old, but were being well maintained. Some sites are small and may not fit all size RV's. Most sites are wooded and will have a good amount of shade throughout the day. We would stay here again. We camped at Wompatuck State Park in a Travel Trailer. Nice, quiet state park just outside of Boston. Two areas of campground, one area has no hookups at all, the other only has electricity (20 amp only), no sewer hookups. They do have a dump station. There are water spigots throughout the campground, so before you set up, you can fill your freshwater holding tank. When making reservations, it may be a better idea to call the park rather than use Reserve America, as not all the sites are the same size. Some are very narrow, while others are more spacious. Nearly all sites are very shaded. There are miles upon miles of hiking/biking trails throughout the park. The restrooms were fairly modern and nice and clean. There is also a natural spring nearby with nice cold, fresh water. The park was very empty , though we only stayed during the week. They evacuated the park for Hurricane Irene, and refunded the money automatically for the night that were reserved, but not used. 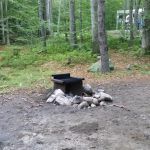 All around a good campground, and we would definitely stay here again if in the area. We camped at Wompatuck State Park in a Tent Trailer. We stayed here over Memorial Day weekend. The park was pretty nice. Staff was friendly and fairly helpful. My wife used the showers and said they were cold and no-so-clean, men's room looked fairly clean. There wasn't a lot for kids to do (I didn't see a playground anywhere) so they rode their bikes a lot. Our site was pretty narrow with a lot of branches and brush hanging into the site. There was a small brook behind our site so the bugs were out in FULL force. (Don't forget to bring LOTS of bug spray.) The firewood I bought at the office was wet so I ended up burning the abundance of dead branches and brush I found on our site. Our site was missing the picnic table and when I asked at the office about it, I was told that their supplier shorted them. He said he'd try to find one for me but one never showed up (even though I saw several sites with more than one table) so I had to use my grill on my tailgate. This park is about 15 minutes from a 'T' station if you want to go to Boston. No enforcement of parking/driving rules(multiple cars on sites clogging the roads, people speeding and going the wrong way around one-way loops). I was surprised that it was very quiet in the evenings for a holiday weekend in a full park. With a little bit of cleaning and some site maintenance this could be a great park. 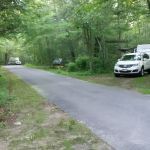 We camped at Wompatuck State Park in a Travel Trailer. Are you affiliated with Wompatuck State Park ?